Hemisphere view of Mars with one of the regions rich in phyllosilicate (clay) minerals outlined by the white box. The large, dark area right of center on the hemisphere view is Syrtis Major. The most comprehensive study ever conducted of minerals on Mars' surface reveals the planet has undergone three distinct geological eras throughout its history, with water playing a progressively lesser role in each. If life as we know it here on Earth ever existed on the red planet, it could only have survived in the planet's infancy, during the earliest era, the study concludes. "Starting about 3.5 billion years ago, conditions on Mars became increasingly dry and acidic--not a pleasant place for any form of life, even a microbe," said study team member John Mustard, a geologist from Brown University. 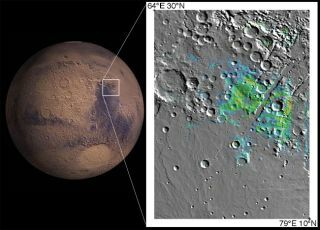 The mineral maps were created using data from OMEGA, the major spectrometer aboard the Mars Express, as well as related observations collected by other Mars orbiters and the two rovers. The study, led by Jean-Pierre Bibring from the University of Paris, is detailed in the March 21 issue of the journal Science. The first era, which lasted from about 4.6 billion years ago to 4 billion years ago, was a relatively wet one. The oldest rock--exposed by erosion, impact or faulting--showed the presence of clay minerals, such as chamosite and nontronite, that require abundant water, moderate temperatures and low acidity to form. The next era was drastically different. Massive volcanic eruptions spewed sulfur into the atmosphere, turning the planet's moist and alkaline environment to a dry, acidic one. This period lasted form about 4 and 3.5 billion years and is evidenced by minerals such as gypsum and grey hematite, which were found in Meridiani and in Valles Marineris. Minerals from the most recent era, which began about 3.5 billion years ago and continues to the present, show no evidence of forming with, or being altered by, liquid water. These iron-rich minerals, mostly ferric oxides, were found across most of the planet and reflect the cold, dry conditions that persist on Mars to this day. The new study also revealed what is responsible for Mar's reddish hue: most likely, the researchers say, the red planet gets its color from tiny grains of red hematite or possibly maghemite, two minerals that are riddled with iron. If Martian life ever did exist, it could probably have only survived during the first era, the team reports. And evidence for that life is most likely to be found in the Syrtis Major volcanic plateau, in Nili Fossae and in the Marwth Vallis Regions, two regions rich in the clay minerals abundant during Mars' youth. The researchers added that these areas would make compelling targets for future lander missions.